When we’re young we all think we’re musicians. We bang on empty boxes before we’re even off the bottle. We slam out sounds on kid’s keyboards before we can crawl. We pound on pots and pans prior to learning how to wobble and walk. Usually, we even have the rock star attitude to accompany our masterful musicianship. We may not have been able to lift televisions, but we could throw some toys in a tantrum. We may not have been able to ravage hotel rooms but we could ruin a kitchen with some spaghetti if our caretakers were bold enough to turn their back. We may not have been big enough to beat anybody in a fight, but we weren’t above biting and crying if it came to that. Mostly, though, we just liked sounds and making them ourselves, especially when our guardians thought they were going to get us to go to sleep. Just like kids can be clever when it comes to creativity, the Buckhannon Mountain Fools play some really resourceful, interesting instruments to make rhythms. Playing what is presented as Appalachian Folk Grass, Timothy DeWayne Strother, Jeffrey Lynn Winemiller, and Steve Holmes are a sight to see and a pleasure when they perform. With Tim on vocals, banjo and guitar, Steve on vocals, bouzouki, Irish bouzouki and bass, and Jeff on vocals, guitar and washtub (yes, I said washtub), this trio is a talented treat! Being from Buckhannon, West Virginia, they have been doing what they do for over a decade, mostly on a porch of a country cabin, and recently they decided to share the sentiment that they saw in each other. Sara Fincham: When did you transition from jamming to playing out – was that a continuous conversation from the beginning, or just a natural next step? Jeff Winemiller: About three years ago, Tim and I and Steve and another friend of our played out a little bit, then we all went our separate ways. Tim and I have been playing in this configuration (tub and banjo) for about 3 months. We decided to do some open mics and form a new project. Things just blew up from there. SF: I talked to you briefly before about how you boys banded together, but could you share that story with SoundPlanet? JW: Tim and I have been jamming together in some way shape or form since we’ve been hanging out, over 15 years. Our first musical mentor was a man named Steve Smith. He was a great banjo picker and had a band in the 70’s and 80’s called Mulberry Grass. He taught us most of what we know about traditional, old time, bluegrass music. He taught Tim a great deal about the banjo. I initially played an electric 6 string bass with them. We jammed off and on for years, then last summer we built the washtub. SF: Buckhannon, musically, you really have to be a self-starter and get the scene going yourself – how successful have you been getting the bars/restaurants on board and working with other musicians who are trying to make music more of a milestone? JW: When we decided to do this project, there were 3 or 4 open mics a week in Buckhannon. Not bad for a small town like ours. There is a nice network of great musicians here in Bucktown and Elkins. We hooked back up with Steve at some of these open mics. I’ve gotta mention Uncle Eddi and Robin. They have helped us get some really great gigs. 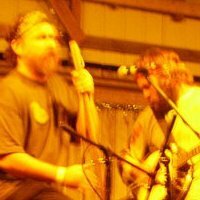 Also some friends of ours in Elkins have a jam band called Zen that throws festivals on their farm. They had us play at 3 shows this summer. SF: Outside of your obvious original show, one of the things countless things I commend you for, you mentioned to me, that you try to play causes that you care about, shows that support something. First of all, thank you, and secondly – how’s that going – is it easier or harder to book those shows? JW: We do like to have an activist component to the band and love playing events and shows for causes we love. One of the first real gigs we got booked for was an Arts Festival in Buckhannon to support the local arts co-op. Eco Fest was another gig like that. We try to do as many of those type of gigs as possible. SF: How many open mics do you play in a typical week and how do you keep it fresh and fun, as usually it’s the same people who play those places? JW: We try to do at least on open mic a week for now. Schedules are a bit tight for the moment. Tim is a full time student. We always try to rehearse new material and put our own spin on it. We are also writing a lot right now. SF: I have to say you were so kind to come to EcoFest and play at the park. I hope you met some people and also congratulations on getting to play the Wheeling Jamboree! What does the Jamboree represent to you, and how important is it to network as a musician (as I was gratefully told about you by another band!)? JW: Thanks for congrats on the Jamboree. We are very excited for that opportunity. We will be backing up our new friends Uncle Eddie and Robin. Networking has been a big deal for us. We set up a Facebook page when we came up with our band name. Within just a short time, we had booked gigs just from having that page. We met Uncle Eddie and Robin because they saw some of our vids on the page and ended up jamming with them and playing a little with them at a gig in Thomas, WV. We have also met booking agents, writers, and tons of other musicians. Almost every gig, we have someone wanting our contact info. SF: Right now are you just focused on playing and performing or is there a cd in the works that we can look forward to? JW: Our main focus will always be bringing the live music, but we do have plans to get a cd together.